Tax season is again here, its time to takeout your old investment files and to calculate your returns. As per the sections of Income Tax Act, 1961 which are detailed below are the exceptions and categories that you can take advantage of. Under section 80C of Income tax Act, upto Rs. 1,00,000 are non-taxable if your invest or buy the following instruments (upto maximum of 1 Lakh). For example if you earn 5 Lakh per annum and if you invest 1 Lakh total in 80C instruments then the taxable about is 4 Lakh. 1. Premium for Life Insurance or ULIP. 2. Provident Fund (PF) contribution. 3. Public Provident Fund (PPF) - only up to Rs. 70,000 in a year. 4. Repayment of Home loan principal. 5. Equity Linked Savings Schemes (ELSS) of Mutual Fund Companies. 7. 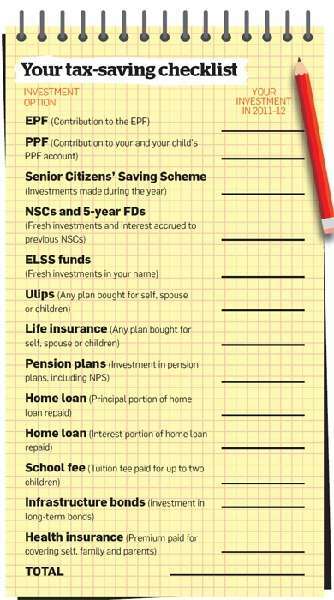 National Savings Certificates (NSC). 8. Tax Saving Fixed Deposits with Banks. 9. Tuition Fees of children. 2: PPF returns are set by the Government of India and can be revised either upwards or downwards in any year. You can take advantage of an annual deduction of Rs. 15,000 from taxable income for payment of Health Insurance premium for self and dependants. For senior citizens, this deduction is Rs. 20,000. You can claim a deduction on the interest paid on loans taken for higher education for yourself, your spouse and children. There is no limit on the amount of deduction you can claim. The only thing to keep in mind is that the program for which the loan is taken should be a graduate or post-graduate program in engineering, medicine or management or a post-graduate course in the pure or applied sciences. Under Section 24, a maximum of Rs 1,50,000 can be deducted from your taxable income as interest repayment for a self occupied house. Please note that this deduction is not available if you the house is still under construction and you do not have occupation of the house. You can take advantage of the provisions under this section if you are renting an accommodation. These provisions will not be available to you if you stay in a rent-free accommodation or live with your family or in your own house. Rental accommodation is in Delhi. Rs 11,000 being the least of the three amounts will be the exemption from HRA. The balance HRA of Rs 4,000 (15,000-11,000) would be taxable. Please note that HRA exemptions are only available on submission of rent receipts or the rent agreement. If you want to pay rent to your parents or any relatives (like uncle/cousin) whom you are staying with. You will need to treat them as landlords. And request the owner of the house (which will be one of your parents) to declare it in his/ her personal income tax return. This will prevent any litigation in the future. Transport allowance granted for commuting between your residence and place of work is exempt up to Rs. 800 a month. You can take advantage of this provision to get a tax exemption of Rs 9600 annually by providing your employer with bills or a self declaration. You can claim exemption up to Rs 15,000 annually on actual expenditure incurred on your medical treatment or for treatment of any of your dependents. Moreover, there is no restriction of approved hospitals or clinic for the same. This is exempt only on provision of actual bills. However, if the amount is paid out as an allowance not a reimbursement then it would be fully taxable. 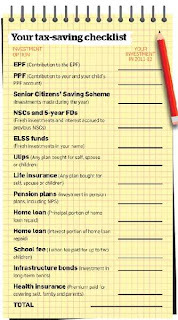 Tags: How to save my Income tax, Tips to save my income tax this year, Tax filling, Investments, Life insurance, Medical insurance, Mutual Funds, allowances, House loans, 2012 smart ways to save tax, tips to male tax related investments before 31st march, Tax saving, Mistakes, Financial year, Tax returns, How to Save Income | Smart ways to save Income Tax | Tips for Saving Tax | 2012, 2011-2012 income tax slabs, 2012-2012 income tax slabs, income tax efiling, how to file for incometax returns, Online Free income tax calculator, Excel, software, 2011-2012, 2012-2013 FY, tax consultant, finance advisors, mortgage, personal loans, finance, savings, deposits, banking, India finance, calculator for Income tax 2012-2013. Tax free investments are important tools in the direction of income tax savings. They might not be that profitable in returns but save a lot fro your tax payments. Making charitable donations are also helpful. They save tax and prove your philanthropic attitude. Gifting can also reduce the mount of tax you pay. without the actual cost of hiring one.